Rustici Driver (previously referred to as SCORM Driver but changed since it does so much more) helps you convert your eLearning content so it’s compliant with SCORM, xAPI, cmi5 and AICC. 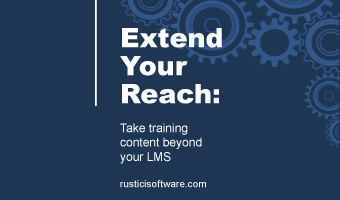 Whether you’re hoping to add eLearning standards support to an authoring tool, convert your content library or deliver non-standardized content to an LMS, Rustici Driver can help. Rustici Driver allows developers to make simple function calls without having to worry about the underlying standards. Adding support for SCORM 1.2, SCORM 2004, cmi5, xAPI or AICC is now a simple configuration setting. From within your eLearning content, the complexity of the standards is removed so that you can provide support without being a standards-expert. Don’t worry, that’s our job. Tens of thousands of courses have been delivered using SCORM Driver, now Rustici Driver. The software is constantly evolving to accommodate eLearning standards that change and LMSs that are a little weird. Every time we hear of a new way we could improve Driver, we do so. Whether adding support for a new standard, like cmi5, or simply ensuring our content is compatible with every LMS you encounter, we make sure it just works. It is impossible to know how every LMS will function. When these situations arise, debugging tools like the Rustici Driver Debug Logs and our SaaS application SCORM Cloud will make sure you’re able to identify the root of your problem or the source if the problem isn’t yours. If you’re still unsure, our support team is there for you and you can ask us anything. We’ve been working with the eLearning standards since 2002, which means we have a wealth of knowledge to draw from. 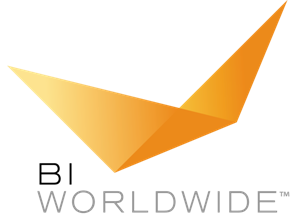 We excel at identifying the source of a standards-based problem and providing a solution. Working with the standards is hard, that’s why we’re here to help. Need help playing eLearning content cross domain? Rustici Cross Domain (RXD) works around SCORM’s requirement for the content and player to reside in the same domain. If you’re a content provider whose content is better housed on your servers, we’ll help you overcome communication challenges while still meeting your client’s request of delivering your content to their LMS. 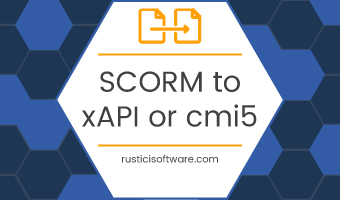 RXD supports SCORM, AICC, cmi5 and xAPI. Rustici Dispatch connects with your application via an API to help you control the content you share with other learning systems. Rustici LRS is an integratable, conformant learning record store (LRS) that can help your application receive, store and return xAPI statements. These are just some of the companies using Rustici Driver today. Ready to talk about Rustici Driver? Get in touch to talk about how Rustici Driver can help you support the standards.